Hi everyone. I'm back. We had a fun visit with my husband's family in Dallas last week. Lots of good food, fireworks, and fun time with family and friends. And thanks to everyone for the wonderful birthday wishes. We had a quiet day at home. I got a fair amount of writing done and did no cooking. My kind of day. Thanks for those of you who stopped by for my interview with Laurisa White Reyes and the giveaway of her upper MG fantasy THE ROCK OF IVANORE. If you haven't stopped by to read her advice, especially on middle grade marketing, and to enter the contest for her awesome book, I'd encourage you to do so. The link is at the top of the blog. And Laurisa is having a t-shirt contest here. Next I've got winners to announce. Yay! The winner of WHILE HE WAS AWAY is MARYBELLE! The winner of TO RIDE A PUCA is LEIGH! And the winner of TRACING STARS is BARBARA WATSON! Today I've got a great giveaway for you. And I’m excited to interview Lenny Lee, a 12 year old, 7th grader, who is an aspiring author and a fantastic blogger. If you haven’t checked out Lenny’s blog, I really recommend it. He doesn’t blog that often but whenever he does, his posts are as complete and mature as any adult’s. They always blow me away with all the useful info and how well-written they are. Hi Lenny. Thanks so much for joining us. 1. Please tell us a little bit about yourself, your school, and what you like to write. hi miss natalie! thanks for having me on your cool blog. i have a teacher that comes to the house so i dont go to a regular school. im a “go green” guy. i love the earth and wanna to help protect it. i love animals especially raccoons. we have a critter café on our deck and feed lots of wild animals. i love to swim and snorkel. i like sports. im a braves and falcons fan. i love to write! mostly i write kids books and im learning how to do picture books. in my stories i always have something kids can learn that could help them in their life. 2. My daughter loves swimming too. That's so cool you write. And I always admire picture book writers because you have to say so much with so few words. What made you decide to start blogging? Tell us a bit about your blog and what you like to blog about. my doctor got me started blogging. she knew i love to write and said it would be a good place to share things. i got hooked up with writers because i love writing and wanted to learn from good writers just like you. mostly i post about writing but sometimes i do posts on stuff that maybe a lot of people dont know like the ones i did about the italian lifeguard dogs or sea lions and dolphins in the navy. on my posts i try to have a catchy title and keep then short and colorful and i always add a picture. 3. That's some awesome doctor advice. Your writing advice is always and it sounds like you're an adult, not a 7th grader. What kind of books do you like to read? i like all kinds of stuff. i like adventure stories, science fiction and books about animals. i love books that get my emotions going and make me feel stuff. i love books that get me laughing. those wimpy kid books make me laugh soooo much. 4. I like adventure stories and science fiction too. It's nice that more sci-fi books are being published. How has blogging changed what you read, if at all? What books are you waiting to be released? blogging is a big help in letting me know what books are out there. i love the blogs that do marvelous middlegrade monday. they review mg books and that gives me a good idea if i want to put a book on my “wanna read” list or not. right now im waiting not so patiently for miss hilary wagners mg book called goblin shark rising and her next book in the nightshade chronicles called kings of trillium. 5. I can't wait for both of Hilary Wagner's books that are coming out. And I learn so much about new books from the Marvelous Middle Grade Monday bloggers too. I enjoy posting with them when I can. Do you buy most of your book, receive ARCS, or get them at the library? How often do you go to a bookstore? right now most of the books on my shelf i won from the blogs. im just real lucky. yikes! i got a ton of them to read. sometimes i get arcs. ive got my own account at amazon.com and i get books from them. theres a library 5 minutes away and we go there lots. we dont go to the big book store so much. Sometimes we go to the used bookstore. 6. I love winning books too and getting ARCs when I can. Do you read any teen book blogs, author blogs, or author or publisher websites? Become a fan of an author on Facebook? Why? mostly i got to blogs about writing but i go to all kinds of blogs because i can learn something from everyone. im not on facebook or twitter so i dont follow anyone there. i follow my favorite authors on their websites or blogs. my favorite mg author is miss hilary wagner. for sure i follow her blog. 7. I know you follow blogs too because we follow some of the same blogs. Tell us how you found out about the blogs you follow and the kind of blogs you like to follow. when i got started blogging and started getting some comments i went to those blogs and read them and did comments and started following them.sometimes id look and see who theyre following and go visit some of those blogs and if i liked them id follow them. then lots of them came to my blog. you gotta be friendly to get friends. mostly i follow blogs that have something to do with writing but i follow some others about things im interested in, especially animals. 8. So true about being a good friend gets you friends on your blog. It's critical to helping your blog grow. Are there things your favorite authors could do that would make you more likely to visit their website, their blog, or become a fan on Facebook? for me book reviews are the most helpful. and, i love interviews with authors so i can know more about them and their life. most of them are just real encouraging. i like blogs where the post is short and interesting and has graphics. i hardly ever read a loooong post unless its got a catchy title and is about something super interesting. Those are great tips on what makes a good blog post. Thanks Lenny for sharing all your great advice. So now onto my ARC giveaways. Click on the titles to read a description of the books from Goodreads. I'm following Lenny's advice and trying not to make my post too long. First, there's UNRAVELING by Elizabeth Norris. I really enjoy mysteries and was intrigued by the idea that Janelle, the main character, comes from a FBI family background. I was immediately sucked into the story in the first few pages when Janelle is hit by a truck, dies, and then Ben brings her back to life. I was totally with her as she tried to figure out how Ben could have brought her back to life, what her father, a FBI agent, is investigating about her “accident,” and her discovery of the ticking clock. The pacing in this book is amazing and full of twists that I had no idea were coming. Because then there is a more serious murder that Janelle is compelled to solve. Sorry I can’t tell you who so I don’t spoil it. And then there was this amazing sci-fi aspect of the story I had no idea was coming that deepened the story so much, if that was possible, and made me unable to put the book down. Again, I don’t want to spoil it for you. Janelle’s very independent and self-reliant, in part from taking care of her younger brother when her mother is unable to and her father is gone a lot. I really liked those qualities in her and her loyalty to her brother. Ben is a mysterious loner, but a really good guy. One of the things I enjoyed was watching the very natural progress in Janelle’s and his relationship from hardly knowing each other to something much more. Elizabeth Norris doesn’t hesitate to dump the worst on Janelle or continue to surprise us, the readers, up to the end. I can’t imagine how she’ll top this in book 2 and can’t wait to see where the story progresses. Next, I'm giving away THE SELECTION by Kiera Cass. This book gets a good review from not only me but from my daughter. She loves dystopian books, but I wasn’t sure she’d like this one because she’s more of a tomboy kid. I thought she’d be put off by the cover. But she really liked it and told me more than once that I should read it before I got to it. This is a really different dystopian tale. After the United States is destroyed, a new country called Illea is born that is run by a monarchy. The society is divided into castes, with One being the best cast to be born into and Eight being the worst almost non-cast. When Prince Maxon is picking his bride, it is an opportunity for 35 girls to get a chance to change their life. But right from the beginning, America, the main character, has no interest in being part of the Selection. Instead, she wants to marry Aspen, a guy in a lower class than her that she’s having a secret relationship with. It’s secret because no one is this world would consider marrying down. After a stormy break up with Aspen and her mom’s nagging to enter the Selection, America reluctantly agrees to enter her name in the selection and of course gets selected. But one of the things I liked about America is that even when she went to the palace and experienced a life so much better than her own, she did not change her mind that she did not want to be selected by a prince she did not think she’d like. Unexpectedly, she meets Prince Maxon privately and a friendship develops. America is a great character. She holds true to her ideals and isn’t afraid to speak her mind, even to the Prince. She’s loyal to her family and wants to stay in the selection so they can get better food and other perks while she’s there. And she’s a good friend to Marlee, one of the girls she meets on the trip to the Palace who she tries to help get selected by the Prince, and to her maids. Prince Maxon is reserved and not very experienced in being with girls. But he’s very attentive and kind. You can tell he’s trying to make a good choice and is concerned about his role as future leader. I enjoyed watching the deepening relationship between America and him. The one thing I hope we learn more of in book 2 is why the rebels are attacking the Palace and what they’re fighting for. And I hope America takes a more active role in this political struggle. I’m definitely looking forward to the sequel and my daughter is already hoping I’ll get an ARC of it. So there will be two winners. To enter, all you need to do is be a follower (just click the follow button if you’re not a follower) and leave a comment on Lenny's interview by midnight on July 28th. Let me know what book you'd like and why in the comment too. I’ll announce the winner on July 30th. If your e-mail is not on Blogger, please list it in your comment. International entries are welcome. On Wednesday, I'm interviewing Leigh Bardugo and giving away a copy of SHADOW AND BONE. I just finished it and it's as fantastic as everyone says. You want this book! I can't wait to share Leigh's interview with you. Then next Monday, I'm interview Natalie Lorenzi about her middle grade book FLYING DRAGON. It's a multi-cultural story about a Japenese-American girl who has to give up her soccer dreams to study Japanese and help her cousin, who just came here from Japan, with his English. I was mesmerized from the first page. Glad you're back Natalie! It sounds like you had a great break. Thanks for the interview. Lenny, it's interesting to hear where you get books to read. My 12 yr old daughter and I read The Selection and both really enjoyed it! I hadn't heard of Unraveling before, but it sounds intriguing. Thanks for the heads up! Great interview Lenny!! Hugs to you! Hey Lenny! Great interview! You definitely know how to write a blog, with just the right amount of good tips and humor, and I'm always glad to see your sunny smile. Hi, Lenny! This was a great interview! "Catchy title, short and colorful, and add a picture"<--this is excellent advice, and nearly as important as your point about reaching out and being friendly. You're a great example for others! Are they ARCs or finished versions? Wonderful interview Natalie and Lenny. It's always great to read about things from a more youthful perspective. Lenny! So nice to meet and get to know you better. And I really need to get reading some Hilary Wagner!! All best with your picture book and other writing. Natalie-great giveaways, thanks and CONGRATS to the winners of your previous giveaways! I know Lenny *waves 'hi' to Lenny*, but it was great to find out more about him. Thanks, Natalie and Lenny, for the awesome interview. Unraveling is on my TBR list. It sounds intriguing. Love seeing Lenny here. Lenny, I'm a big fan of animals and being green too. Sharing on Facebook right now! Oh man, thanks so much for that awesome interview, Natalie! Lenny is the best, and it's really cool to get to know him better. MG books about animals are definitely awesome, and I can understand why he loves Hilary's books so much. Oh, and I'd love to win Selection! Wow, what a great interview, Lenny! I'm glad your doctor convinced you to write a blog. Your writing advice is always great. Aw, Lenny always makes me smile. I'm not always super positive about things, so Lenny's perspective is always refreshing. :-) Thanks for doing the interview, Natalie, and thanks to Lenny for sharing! Wow, Lenny is SO smart and mature for a seventh grader! Great interview, thanks. I enjoyed it and picked up a few tips! Welcome back, Natalie, and best of luck on your writing, Lenny! Hi Lenny! Glad to learn more about you. Really a great interview and I'm so happy to follow your blog, too. I know my daughter would like to read the Selection, so that'sy pick. Hi, Natalie and Hi, Lenny! I loved this interview, and of course I love Lenny. His comments and email always make me smile! And Lenny knows how much I loved his blog on sea lions and dolphins in the Navy. I use that post every year with my fifth grade class as an example of using voice in non-fiction writing! The Selection sounds so good! Love that cover. Thanks so much for the copy of TRACING STARS! I can't wait to read it. Wish all kids liked reading and writing as much as you, Lenny, but I'm sure you're influencing many, many people. Not interested in today's giveaway, but I just wanted to say what a cool kid Lenny is! I'll have to check out his blog! Hi Lenny! It's good to hear from you again. I am excited for Hilary's new books, too. Keep on writing--I can't' wait to see what wonderful and unusual ideas come from the mind of Lenny Lee. So many great things in today's post, Natalie. Glad you had a good trip to Dallas, and a great birthday. Thanks for featuring Lenny, who always seems to have such a positive attitude, and also for the amazing giveaway books. I'm off for a 2-week vacation myself tomorrow, so won't be able to read/comment on blogs. "See" you again in August! I love Lenny! And what a delightful interview! Thanks so much for sharing more of him with us! Yay Lenny! You've got one smart doctor - love that! So many people don't understand the real friendships and connections we can make through blogging! Both books look great, but if I win I'd love a copy of Unraveling. Not only for me, but I have a few students in mind who would love it! Fabulous interview from Lenny!! You definitely can learn something from just about any blog out there. Good luck! I'd also love a copy of either of those books! I gave away my copy of UNRAVELING and now miss it (it was that good!) The other book is on my "to read" list. Glad to hear you enjoyed your vacation Natalie! I haven't heard of Unraveling but it sounds very intriguing. Thanks for the giveaway, but especially thanks for interviewing Lenny!! Hi there! *waves* This was a great interview with Lenny and Hilary is a wonderful author/person to emulate. Great job supporting young writers! Lenny, blogs are a great way to learn all kinds of new things. Great interview! I like scifi too, and I write it. So I'm glad more of it is being published! Awesome interview! Its so cool that Lenny is writing books at such a young age. Thanks for the great interview and giveaway! As for your giveaway, I think they both sound fabulous, but "The Selection" sounds more like my kind of book. :) Have a great day, Natalie! Lenny is such a great writer and I agree, I am constantly amazed by the depth of his insight when he posts. Lenny will be a big name author one day, I know it! Lenny is seriously the coolest cat in town. He always makes me smile and I know all those who follow him feel the same. He's one of a kind and I feel blessed to have met him in this wonderful blogging community!!!!! I would die to win the SELECTION but regardless the interview in itself was a fabulous gift today! I tweeted as well! Though I have no earthly idea how to link it to you! Thanks for the giveaway! These books sounds great. Great interview with Lenny Lee, a new-to-me discovery!! I enjoyed the interview and just found Lenny's blog! Thanks for an interview with Lenny. I was just there yesterday and read his research on habits of different writers. He is a wonderful kid. God Bless him. The interview with Lenny was great and I really liked it. And I would just like to have UNRAVELING because I really LOVE sci-fi and I haven't read any in a long while. Also thanks for holding this giveaway and having the great interview with Lenny. It was amazing. So glad you had a relaxing vacation. Loved learning more about the amazing Lenny Lee! His blog is so inspiring. As a middle school English teacher I loved this interview. Super interesting to see what he's reading and his thoughts on it. Very cool!!!!! I'd love to be entered for The Selection. I've got to stop by Lenny's blog. Unraveling sounds wonderful. YIKES! for sure i didnt know sooooo many bloggers were gonna read my interview and do so many cool comments. and more thanks to the ones who visited my blog and did a nice comment. now ive got some neat new friends. WOW! how cool is that! for sure ive got the best blogger friends in the whole world!!! thanks again miss natalie. youre super cool! I <3 Lenny Lee! Such a wonderful boy! Thanks so much for interviewing him. I can't WAIT to read Shadow and Bone. I got my copy several weeks ago and I haven't had the chance to read it yet. I will soon!!! Great interview, Lenny! Adding a good picture really does help. Fun interview. And I'm really impressed with Lenny - just going out there writing, starting a blog, and being friendly to build his community. That's awesome. Thanks for the great interview, Natalie and Lenny. Lenny always has good stuff to say. Lenny and Natalie what an awesome interview! Nice to meet you, Lenny! Keep up the good work! Great interview! I would love Unraveling. Thanks for the awesome giveaway! Hi Natalie and Lenny - what a great literary ramble amongst that ray of sunshine! Love the way you write and with such aplomb - you're always full of positive, interesting ideas ... and it's been fun learning a little more. Great interview Lenny and Natalie. I would like to check out Lenny's blog but I didn't see the link. Is it posted? That's great that you're going to check out his blog. Thanks Natalie. I Googled and there he was. I'll look more closely next interview. Thanks again! Lenny, thanks so much for your sweet, sweet mention of me and my books! And if anyone doesn't know Lenny wrote me a fanfiction piece about Nightshade City. It was AWESOME!! You are an inspiration to me, Lenny! I can't wait until you are all grown up and we can say we knew you BEFORE you were a famous author!!! Lenny is amazing, I just checked out the blog! Awesome work! Thank you so much for taking the time and making this interview! Great interview! It was refreshing to see a 7th grader being interviewed and he sounds so mature!! I wold love to win Unraveling because I have been hearing amazing stuff about it from absolutely everyone! Thanks for the cool interview and giveaway! I'm always pleasantly surprised to run across such young book bloggers. I'd love to win The Selection. Great interview! Lenny's blog is amazing for someone so young! 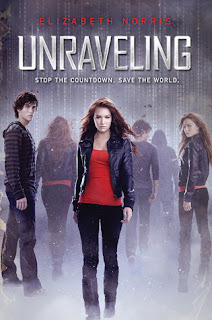 I would love to win a copy of Unraveling - it's been on my wishlist forever! Thanks for the giveaway! 12? 12! Wow. What a blogger! I'll check her blog after this. The Selectiom, because I have Unraveling already. Great interview. Lenny, you have great talent for one so young. Keep on writing! I'd like my name in the hat for Unraveling please. I love a mystery. Happy to hear you enjoyed Dallas! Sounds like you got some great quality time in with the family! Also, I loved the interview with Lenny. It's so great to see young people (okay, so I'm only 22 and probably can't really use the phrase "young people" yet) entering the book blogosphere! I love hearing about adolescents who love to read and write, and I think blogging is a great way for them to practice their reading and writing skills, as well as have a creative outlet! I love knowing that 12 and 13 year olds are writing out there! Awesome! I'd like to read THE SELECTION with my daughter. I know we will both enjoy it. I'd love to have THE SELECTION. I am thrilled to read it cause from your reviews it sounds interesting. Can't wait to have it if I won it. :) Your site is awesome,so as Lenny, too. What a promising author with the young age. Thank you for sharing us the interview. Thanks for introducing me to Lenny! I'm really looking forward to reading his blog. Great interview. Hi, Lenny! Wonderful interview. I enjoyed learning some new things about you. Have an AWESOME day! Great interview! loved getting to know Lenny. That book cover is so intriguing! Lenny, I hardly ever read long posts either! Why is that, I wonder? The Selection was a great book! Unraveling sounds good <3 would love to read that one. Playing for The Selection please because I've heard such good things about it! UNRAVELING sounds interesting. Thank you! Interested in *The Selection*, since it gets good reviews everywhere. The Unraveling, because I love sci-fi thrillers. And thanks for the giveaway! I already read UNRAVELING, and I loved it! 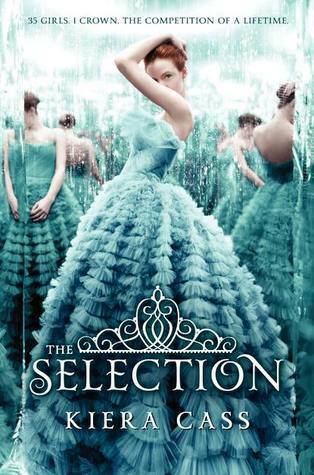 So I would love to win a copy of THE SELECTION! Its nice to meet Lenny. The 2 books sound cool. That is so neat to have an aspiring author on the blog! Way cool! Rock on Lenny! I'd love to get The Selection. I've heard good and bad but I'm still really interesting in the story! Thanks so much! Thanks for sharing such nice content.